the magic that it sings to them. the art evoking heart in them. the sunset with an irreplaceable history. Let me know which of the sunsets you like the best. One of my passions, and this may seem weird to you, is that of visiting cemeteries. I really don’t know what it is that lures me into these places but I have always felt very comfortable in cemeteries. Once I started doing photography the two just seemed to go together. I think that cemeteries can be very peaceful and have many beautiful scenes in them. I visit as many as I can and I constantly look for new ones to explore. Some are abandon and some are well maintained. When I’m in Pittsburgh one of my favorites is, of course, Allegheny Cemetery and recently I found the Homewood Cemetery. Tonights post covers several cemeteries around Western Pa. Such as St. Vincent Cemetery, Unity Cemetery, and Allegheny Cemetery. Hopefully you’ll see the beauty that I have found to be so peaceful. 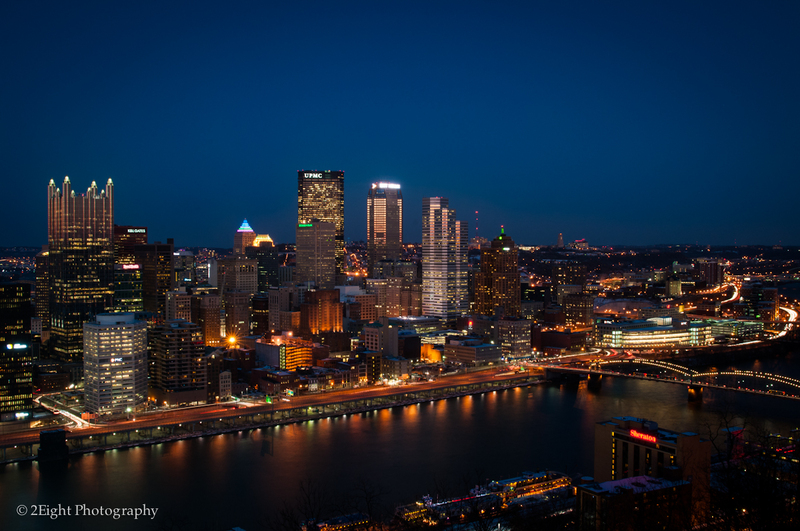 After showing you an overall scene of the city of Pittsburgh, I thought that I would show you a photo that I took on a walk downtown one evening. Yesterday I talked about looking around you to see what the city has to offer. After walking through this corner countless times, one evening I stopped and took a few minuets to look around, then the idea for this photo came to me and the next night I was standing there with my camera and tripod. I think the results were worth it. Feel free to let me know what you think. 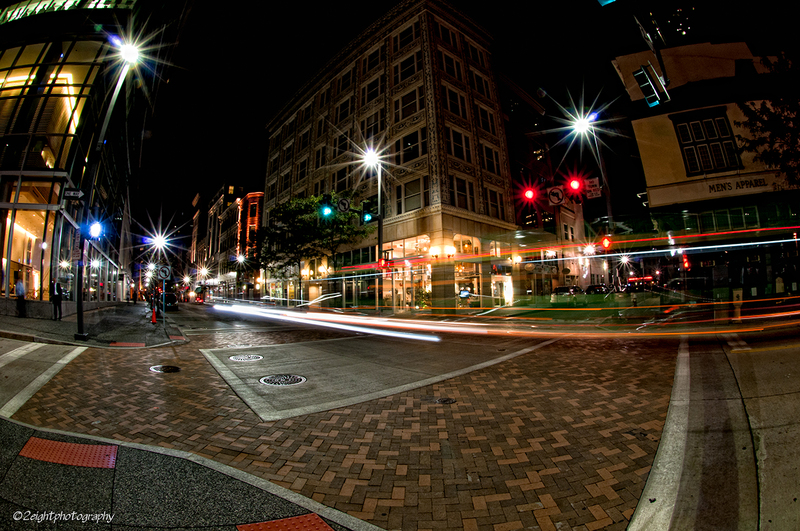 This photo was taken using a fisheye lens and a slow shutter speed to get the streaking of the lights. I will say that my work kept me from getting out today to take any photos but I was able to pull this one from my archives. 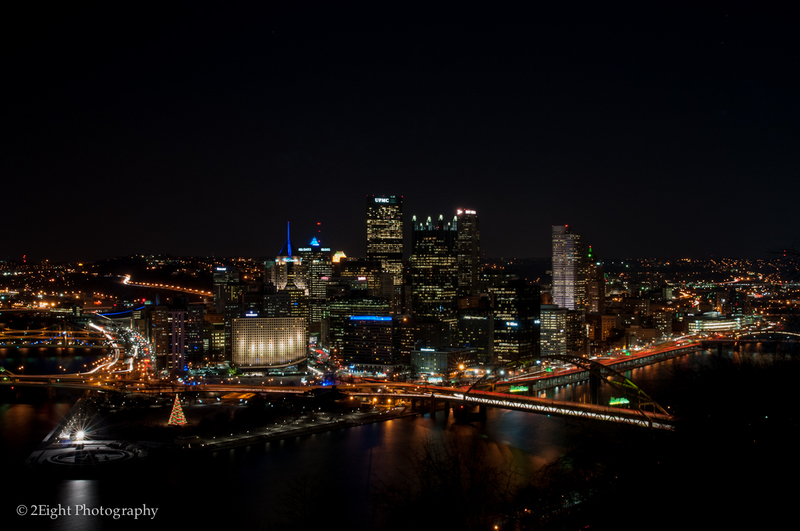 As you can guess tonights post is about Pittsburgh, Pa. Growing up I can remember going to the city for special events like the circus and monster truck races at the Civic Arena. Going to the museums and one of my favorite places Phipps Conservatory. I can remember going to Mt. Washington too see the city scape and especially at night to see the lights from so high above the city. Well I’m all grown now and I travel to the city just about everyday and it still mesmerizes me every single day. There are truly no two days alike and the city is constantly changing, growing and evolving. I’ve spent the better part of the last two years in Pittsburgh and I can say that I see something unique everyday. If you live or work in any city take time everyday to look around and see what amazing things the city has to offer. All to often we get in a rut and don’t see the great things right in front of us, because we are always looking forward to the next “BIG” thing. Today was one of the rare occasions that I got off work early enough to run up to Mt. Washington and see those amazing lights once again. And I would like to share the following two photographs with you. Leave a comment and tell me what amazes you about the city or town you live or work in.